To ensure the health of our spiritual life, we must transform material hope into spiritual hope. Hope—the recognition within the human heart that something better is attainable—can mean the difference between life and death. In Man’s Search for Meaning, Holocaust survivor Victor Frankl writes that the rate of deaths in the concentration camp increased after Hanukkah, even though there was no change in camp’s already horrible conditions. Why did more die? Because each year rumors spread that the prisoners would be freed in time for the holy festival, and when they were not, the prisoners lost hope, their immune system weakened, and they succumbed to a fatal disease. Hope had kept them alive, and when their hope left, they died. By our nature we are meant to be full of hope (hopeful), but hopeful for what? Hopes are of many types but can be broadly classified into two: spiritual and material. In the Ninth Chapter of Bhagavad-gita Krishna uses the word moghasha. Mogha means “baffled,” and moghasha refers to people baffled in their hope. Later on, in Chapter Sixteen, the Lord speaks of asha-pasha, or those entangled in a network (pasha means “trap”) of hundreds of thousands of hopes and absorbed in lust and anger. Hope for any sort of material gain, whether fame, fortune, power, success, or relationships, is like a noose that fetters the soul. We are meant for spiritual hope, but, bewildered by material life, our hopes are now material, and so we are subject to waves of dissatisfaction. One who hopes materially, Krishna says, will be anxious, troubled, and miserable —in a word, defeated. To disentangle ourselves from the baffling snare of material hope requires transforming our hope from matter to spirit. In the Srimad-Bhagavatam Maharaja Dhritarashtra, the elderly and infirm grandsire of the Kuru dynasty, exemplified the process of giving up material hope. After all his sons were killed in the Battle of Kurukshetra, Dhritarashtra was living at the expense of his five nephews, the Pandava brothers, whom he had treated dishonorably for many years. It was the wise Vidura, Dhritarashtra’s stepbrother, who redirected Dhritarashtra’s hope from bodily comforts to spiritual attainment. So, the first step in transforming hope is to see that Krishna, in His form as time, will take everything material away from us. Within this universe no one and nothing can check the onslaught of time. Materially our situation is hopeless: By the Lord’s design, old age and death are coming for each one of us. Through knowledge of our eternal identity—small servants of God—by God’s grace we can gradually stop hoping for things destined to perish. With knowledge of our true identity firmly in place, material desires appeal less and less, and so material hopes, which spring from material desires, lessen. We can feel our intelligence become pacified and our priorities rearranged. Detachment releases us from slavery to trite things and from preoccupation with the past or the future. We accept Krishna’s mercy in whatever form it takes. The soul is eternal, and therefore everyone has a natural urge to avoid death. Dhritarashtra was no exception. He wanted to continue his life in comfort, but the body, being material, will not continue indefinitely. Dhritarashtra’s responsibility, like ours, was to use the body, mind, and intelligence to advance spiritually. The human form of life is a chance for self-realization and for going back home, back to Godhead, not for staying interminably in the material world. Srila Prabhupada comments: “Five thousand years ago there was one Dhritarashtra, but at the present moment there are Dhritarashtras in every home.” Most people remain attached to flickering, meaningless pursuits and neglect the opportunity a human birth offers. They pass their lives without spiritual hope. After accepting the Lord’s will and becoming detached from our material situation (while continuing to do our duty), the next step in transforming hope is to trust Krishna. If we don’t trust Krishna but trust something material, turning that thing into a peg on which to hang our hope, sooner or later we will be deeply disappointed. Nothing material is worthy of our hope. Nothing material can carry us beyond the material, to where we long to go. Trusting something material (including our own intelligence and ability) means that the gift Krishna has given us to come to Him—spiritual hope—is unused. If we trust Krishna we will gain confidence in His teachings. By His grace we will understand that we are tiny spiritual beings completely dependent on Him, and we will want to serve Him and His servants more than we want anything else. Wherever we are, we are not alone. The Supreme Personality of Godhead is with us, and He can protect His sincere devotees regardless of their circumstances. Therefore in any place we can hear and chant the holy names of the Lord, speak about Him, and seek the company of His devotees. In proportion to our sincerity, spiritual hope awakens. Next, Vidura appeals to Dhritarashtra’s free will. Like all of us, Dhritarashtra had a choice: to hope in what is not (in maya, the Lord’s illusory energy) or to hope in what is, spiritual life. Krishna has kindly given all of us free will, and by His grace we can freely do His will. We are free to hope as we choose, yet to hope spiritually is a gift from Krishna that allows us to come closer to Him. Vidura told Dhritarashtra, “Please, therefore, leave for the North immediately, without letting your relatives know, for soon that time will approach which will diminish the good qualities of men.” (Srimad-Bhagavatam 1.13.28) Dhritarashtra could have chosen to stay, but out of his free will he didn’t. Dhritarashtra left for the forest accompanied by his wife Gandhari and by Vidura, who strengthened Dhritarashtra’s faith in the Lord. Faith is, in the words of Krishnadasa Kaviraja, unflinching trust in something sublime. One who has faith knows that by serving the Lord everything is fulfilled. Every soul is meant to give some service to Krishna, and faith lets us stick to that service in spite of all impediments. Faith inspires spiritual hope in the heart. We live with the anticipation of what can be—that despite our shortcomings we may go back home, back to Godhead. Living with this hope, we accept the things we cannot change, knowing there is a reason for it all and that ultimately the person who controls it, Krishna, is our well-wisher and most dear friend. In the song Sri Guru-vandana (“The Worship of Sri Guru”), Srila Narottama Dasa Thakura uses the word asha twice. 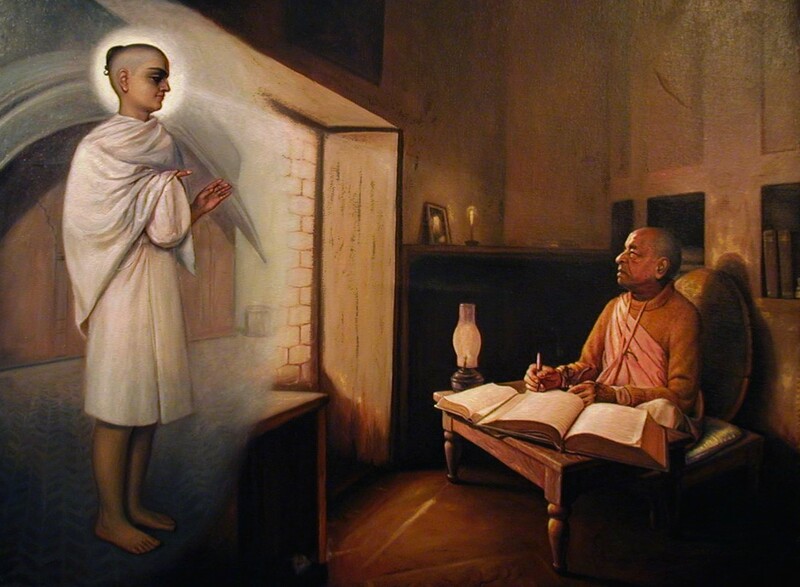 By hearing from the bona fide spiritual master, as Dhritarashtra heard from Vidura and as we hear from Srila Prabhupada, we learn of the dignified position of the soul—that is, of ourselves—and worldly charms become like phantoms. Misdirected hope misdirects and reduces us. “Why shall I let material hope cheat me?” we think. “That hope only plunders me and makes me miserable.” Lacking spiritual hope, we lead a sad, deprived, one-dimensional life full of personal problems and disarray. Bound hand and foot to compulsions, illusions, and idiosyncrasies, we never do what we really want to do but only what fear, envy, and anger dictate. Dhritarashtra, caught in a snare of politics, luxury, and family attachment, tried to be materially successful but was thoroughly frustrated. But by the forceful instructions of Vidura, an exalted devotee of Krishna who evoked Dhritarashtra’s faith, Dhritarashtra achieved success in self-realization. Devotees like Vidura not only cut the shackles of mundane affection but also nurture the spiritual bonds that pull us to the Lord. Similarly, by our faith in Srila Prabhupada and his representatives and by their mercy, we become renegades from the hopes of a materialistic culture. By accepting the Lord’s will, becoming materially detached, trusting what He does, using our free will to engage in His service, and increasing our faith in Him, we are cherishing and harvesting the experiences that nourish hope. Gradually we simply desire to improve our service to the Lord. And although we may be unqualified in so many ways, we are confident that somehow or other we will be spiritually successful. Spiritual hope lets us use things for their true purpose, namely as means to bring us to Krishna. To live with spiritual hope is to live in the present, ever inspired by the future. It is to live feeling that by surrendering to Krishna we will have everything we could ever want. When we hope in Krishna, we are freed from the confusion of hopes that spring from lust and greed and we are bound to that Supreme Person who can bring us to a realm beyond our imagination. Although Dhritarashtra used ashtanga-yoga to become free of illusory hope, in this age the recommended process is bhakti-yoga. By following the rules and regulations of bhakti, fixing our minds on the Lord and serving Him in whatever way we can, our inane material hopes quiet down. As the spiritual master’s words personally and intimately touch and convince us, the distance between Krishna and us gradually closes. Spiritual hope prepares us to experience divine things. By its mystery we possess the promise of love of Krishna no matter what happens. This hope is the difference between spiritual life and spiritual death. Hope saves or enslaves us. Spiritual hope gives us focus and purpose; it gives everything we do a powerful and expressive resonance. Our spirits lift, we walk on this planet with confidence, daily experiences become meaningful, and getting up in the morning becomes a joy. Spiritual hope gives life lightness and fullness. It fosters spiritual growth, makes us bold, lively, compassionate, and indifferent to mundane fighting and the accumulation of objects and money. It allows our life to grow in love, grace, and endless satisfaction, for it brings us to the truth and beauty of the Lord. And what is the purpose of existence but to discover His truth and beauty and to share it with others.